Fossil fuels currently play a critical role in industry, not only as sources of energy, but also of feedstocks and process agents. Clean electricity could provide a sustainable alternative, but hurdles remain – particularly in terms of costs. In Northern Europe, offshore wind is showing potential to provide significant amounts of clean power to industry, with generation costs possibly falling to the range of €55 to € 70/MWh. This increasingly affordable renewable electricity strengthens the potential for cost-effective replacement of fossil fuels by electricity in industry. However, the continuing cost gap with the direct use of gas or coal to generate heat limits this potential to those electric technologies that are at least twice as efficient as fossil fuel uses. For now, a complete shift would require carbon prices at levels up to € 150 per tonne, a level even higher than projected for 2040 in the World Energy Outlook Sustainable Development Scenario (SDS). Another realistic first step towards accelerating sustainable energy in industry involves hydrogen produced from clean power via electrolysis from water, directly substituting for hydrogen produced from fossil fuels. Hydrogen is already used in refineries to make oil products cleaner, and in the chemical industry to produce methanol and ammonia, a basic constituent of nitrogen fertilisers. It could also potentially be used in steel making to sharply reduce CO2 emissions. Moreover, storable and transportable chemicals and fuels incorporating renewable-based hydrogen (significantly easier to ship and store than diatomic hydrogen) may be imported from areas with better renewable resources, also at lower costs. Today, hydrogen production in Europe is mostly based on natural gas reforming, but this results in significant CO2 emissions. Emissions could be reduced by using carbon capture and storage, at lower costs than from electrolysis run on power from offshore wind (unless future gas prices exceed expectations). The figure above represents this trade-off. 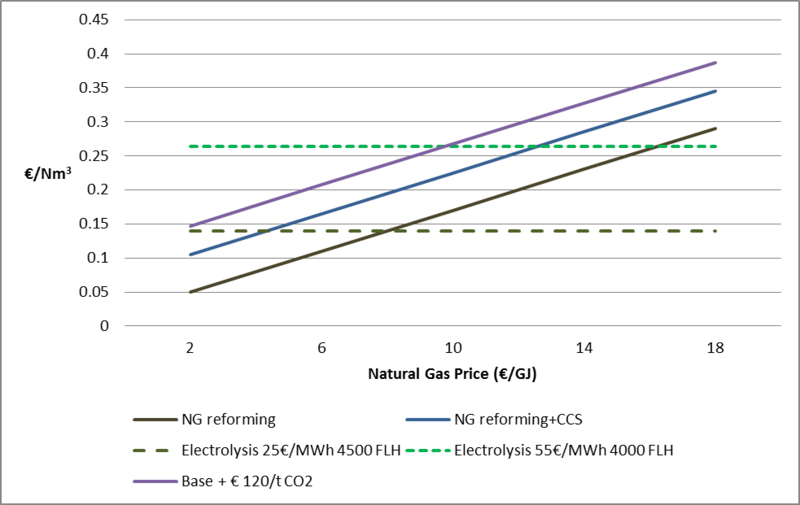 The hard lines show the costs of hydrogen from steam methane reforming as a function of natural gas prices, without or with carbon capture and storage, or with the carbon price assumed by 2040 in Europe in the SDS. The dotted lines represent the cost of hydrogen based on water electrolysis with electricity costs of € 25/MWh and € 55/MWh, meant to represent the lowest achievable costs of hybrid solar and wind power in the World’s best renewable resource areas, assuming in particular favourable financing conditions, and of the cheapest offshore wind power available in Northern Europe by 2025 or 2030. That all said, producing hydrogen from offshore wind in Europe could provide other benefits, including greater energy security, and lower price volatility. In addition, procuring clean hydrogen-rich chemicals and fuels from the deployment of renewables in areas with better solar and wind resources, such as North Africa, could represent a welcome diversification of energy imports. Domestic production of electricity would fare even better on this criterion. In this context, a reasonable policy for Europe might follow a double track. First, accelerate deployment of offshore wind power and the electrification of the European industries, both directly with efficient electric heating and process technologies, and indirectly through hydrogen production. And second, initiate conversations with neighbouring countries with excellent solar and wind resources (and potential investors) on renewable capacities, conversion plants and other infrastructures from which a trade of hydrogen-rich chemicals and fuels could develop, for the benefits of both exporting and importing countries. Ammonia production in North African countries could offer a good starting point. Cette entrée a été publiée dans Renewable energy le mai 25, 2018 par Cédric Philibert.